After a few weeks i recieved my new makerbot shell from uni, sadly during constructions, 2 pieces went snap, therefore i have an almost clear makerbot shell… – pics in my flickr pool! this evening, i finally managed to get the motors soldered into place and test the thing out. The lights from the electronics illuminates the makerbot industries engraving rather nicely! also downloaded the new ReplicatorG and tested out the new preference settings – my heated build base was not getting to the correct temp as i was using a 1mm thermistor and the 3mm settings – the extruder had a 3mm thermistor. 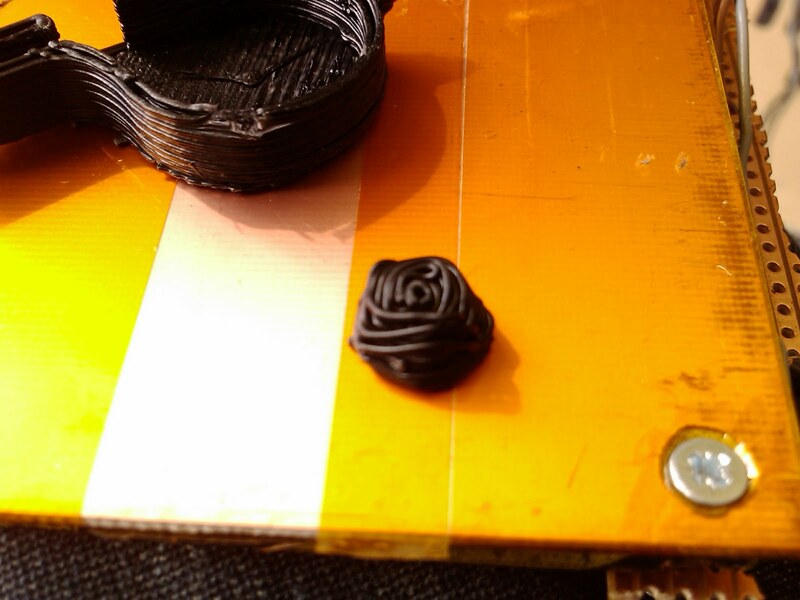 so i finally tested it extruding, and wow… heats up, looks very sweet and …. 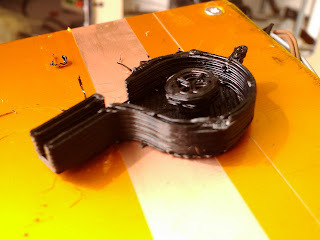 ah… sadly the filament stripped. need to move the idler wheel closer! other than that, i bought a few more 5gram servos to make a small miniture animatronic head. Im designing it using sketchpad and consists of a jaw, square skull with curved pieces, eyes that move left right uop and down, and eventually eye lids – all printable on the makerbot. here is for good testing tomorrow! Last night I decided to take apart my makerbot and put it in its new shell properly. Something’s I didn’t not take into consideration was the extra holes I made in the printer chamber base to attach the electronics, nor the fact I soldered the wires for the motor. After cutting them, I continued to piece together the shell, sadly it didn’t quite fit resulting in the fragile plastic shell snapping in more than 3 places… as well as having the tabs snap off about 3 places. I’m not enjoying it at all… so now I’m left with a makerbot shell snapped, a wooden shell, and a makerbots bits box that need rebuilding… fun… not. DONT MAKE IT OUT OF PLASTIC! Wood is the way to go. Black as night, Evil as Darthvader! Afternoon on this glorious sunny day! i thought i would start printing with my black ABS to see whgat it is like. and results are good! Unfortunatly i have had a few flossing issues – but i will sort that out later. The first thing i needed to do was to feed through the black abs. This would be odd as i have been using white ABS so it was interesting to see a fhite filament turn grey as it mixed with the black ABS. The next thing to do ws to use my Darf Vader i had previously Skeinforged… sadly i had deleted it when i was sorting out my hard drive, thereofre i opened skeinforge and redid it. Sadly skeinforge seems to get stuck and freeze half way through the process, therefore i tried my already skeinforged piece – the clean whistle. First results seem to be good except the raft came off the build base, therefore i had to abbort, but it looks good so far! IMAG0422.jpg, originally uploaded by Roboteernat. This is my new makerbot shell from uni – as part of there makerbot manufacturing they cut me a new clear shell and plastic x and y stages aswell 🙂 looks very sweet! IMAG0425.jpg, originally uploaded by Roboteernat. A new free makerbot shell from the spare materials from the University of Plymouth makerbot making. I will soon transfer mu parts from my wooden case to the acrylic one just after i have got my job (interview tomorrow) and tidied everything up. The arrival of the plastic filament will be tested tomorrow when i start to extrude some – i already have Darthvader awaiting! On wednesday last week, i took my makerbot to my uni and showed it off to the tech dept there – they were the ones to originally cut out the shell in the first place. Attending the demo were some technicians and the guy in charge of the faculty of engineering. 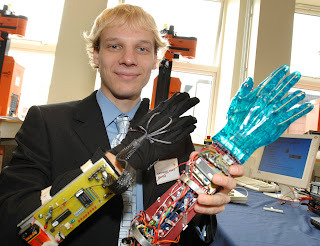 He saw the makerbot and instantly asked for the uni to produce one. I did tell them they needed to make any improvements open to the community, and with a flick of a switch, its now been 7 days, and they already have a shell and parts and electronics being made on the uni PCB milling machine – LPKF machine. Its only been a week! 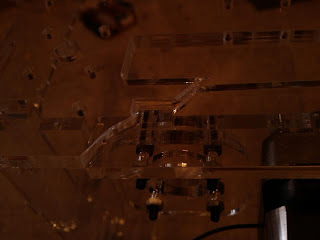 One thing is tho, they did buy a bit too much acrylic to make the shell from… 5mm clear perspex sheet… i went and saw it at lunch time, and showed them the way it fits togeter. then at 3pm, they said they cut me a shell out of the spare acrylic. Sweet! 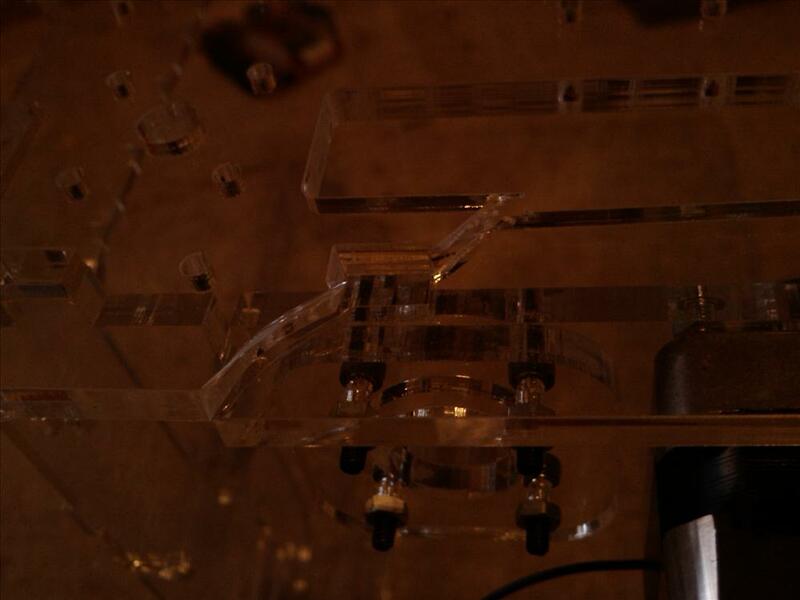 a clear makerbot shell is mine… ALL MINE!!! then i used nichrome wire held on with kapton tape to an acrylic build base. This worked for a short while until the nichrome etched into the acrylic causing it to bend. This is my latest solution, and one i been using for about a week and a bit now, but i wanted to wait on blogging it incase it failed too. But it hasnt! Drill 4 holes using your heated build base as a template. these need to match up and be square so it fits the build base neatly, and allows heatness to cover the whole build area. Because i had severall attemots at the heater nozel, i have lots of spare nichrmoe without the inlator, therefore iused lot of kapton tape. First we need to cover the BOTTOM – the bit nearest the build base, this protects from possible shorts. This meas 4 strips of kapton tape width 1 inch on the bottom then layer a second layer the other direction so there are a total of 2 layers. The important bit is that there is no overlap to the front. this is because we want the top to be flat as possible! Once this has been put down we can l;ay the nichrome. Using the method of connecting your wire to the non solderable nichrome, just this time, add the 2 lengths of nichrome to the one wire. 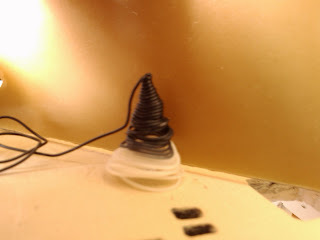 Then tape donn the nichrome so that it covers the whole area equally. Next we can add the thermistor. Solder wires to the thermistor, and then attach this to the center of the board. Then cover the whole lot in a few more layers of kapton tape. The final step is to lay a flat layer of kapton tape onto the top of the build base… this is where you can toop the tape onto the reverse. This is ythe strip board where the connector is placed where you can easily unplug the build base from the cable loom. Solder the wires so that they are neat, and goto the pins of the connector. i had 2 heater wires then 2 thermistor wires. My original connector – using ethernet plugs had this different. Where the screw holes are, you need to cut the strips so that the metal nut would not short things. Add the nuts, so that the build base is secure. then thread on the stripboard remembering that the connector needs to face the right way. Secure with 2 nuts. Part 4. The cable loom. The final step is to connect the connector made using the Pleasentsoftware method (link above) and to attach it to the build base. Change the settings for replicatorG, and skeinforge – the Chamber setting! Connect the thermistor to the extruder board, and the heater wire to the A- and A+ connector, let it heat up and enjoy flat printing! I went to speak to a lecturer in Hertfordshire Uni as i really want to get into animatronics, and the skills i learnt on my Robotiocs BSC and MRes course didnt quite get me there, so im now looking at the MA special effects course, Which is REALLY interesting! anyways! i did say that it will probably be next year i will attend, as i need to save £8500 just forthe tuition fees, and bearing in mind that this will be in Hatfield 0 near london, prices do start to increase! Thirdly… which i will blog shortly is my makerbot! I have finally workid out my heated build platform for my makerbot… using Kapton tape, FR4 PCB clad board and Nichrome wire 🙂 – Will blog about this shortly so i can lnk it on thingiverse.